school where I obtained a scholarship to play NCAA Division I baseball at Northwestern State University in Louisiana, and I graduated in 2007 with a bachelor of science degree in psychology. 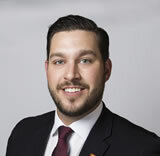 I have been with CIBC for 10 years, and I have been extremely fortunate to grow and develop in a variety of roles that have stretched my abilities, capabilities and thought process. Being a leader and having an impact on employees and our community is the most rewarding part of my role as a general manager. Q: What’s the number one thing you are working toward that you haven’t yet accomplished? A: Obtaining my Certified Financial Planner Designation (CFP). Q: What is the biggest obstacle you’ve overcome? A: Moving from Toronto to Sudbury to further my career, coming to a community where I did not know anyone, and having to start fresh. Q: What would be the theme song of your life? A: Watching people develop, grow and excel, and knowing you had a part in their journey.